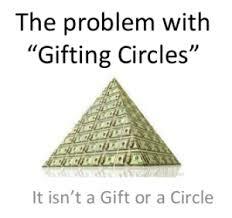 Ever heard of a Gifting Circle? If not, please read on. If you are ever invited to join one- Don’t! the invitation was a high honor given to very few. I was asked not to tell anyone about the secret circle, not even my partner of ten years. I was told that the women in the secret circle were “amazing” and that they would help and support me with my goals in life both emotionally and financially. I was also promised the opportunity to receive $40,000 from this secret circle, but first I would need to pay $5,000 for the honor. I would then need to find more women and invite them into the circle at the bargain price of $5,000. 3. They ask you to keep a secret- Aside from surprise parties, how many secrets do you know of that lead to health and wellness? 4. They require $5,000 up front for no goods or services in return except a weekly chat on the phone, which, if it is a circle of friends, should be free or involve minimal expense. Check out: Meetup.com. 5. 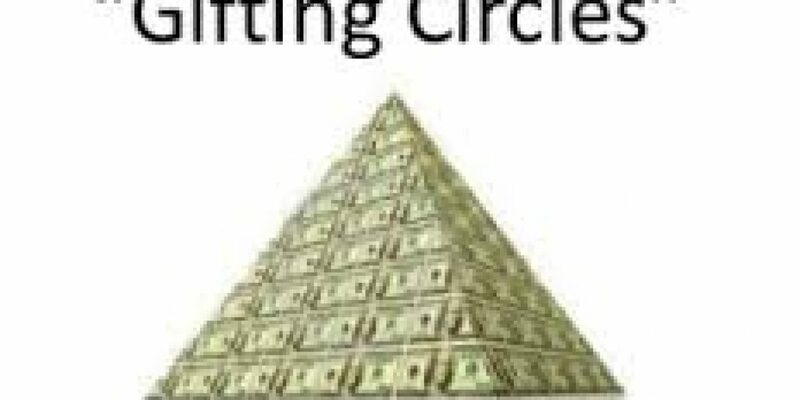 They are a Pyramid- not a circle- with one person at the top being serviced by dozens of others below them. Those at the top never experience the loss they caused to the ones below them. It is criminally violent, negligent, and cruel. 6. They perpetuate a mental trap of shame, embarrassment, and a desire for revenge, often acted out on new, innocent victims. Once a person is deep into this long con, it is very difficult to extricate oneself from the psychology of justification and deception as they continue to convince others to make the same mistakes they know deep down that they have made. This burden can eat away at a good woman’s spirit. Please- if you are part of this social plague- stop the cycle, endure the pain of your error, and KNOW- you can return to grace and honesty at any time. You are inherently beautiful, no matter where your learning process takes you. Vow to do unto others as you would have them do unto you. Thank you, Amber, for the excellent information. I am doing my best to pass it on and uphold the integrity and the meaning of Women’s Circles. Women should meet this epidemic with compassion but firm intolerance. I know there are sincere and truly supportive women’s gatherings that offer real community. Never settle for less! And never keep secrets that involve up front cash for promises. This illegal social phenomenon is an unfortunate example of out of balance Spider Medicine. When this tiny little danger bites, she can cause unseen and hard to prove anguish. To balance Spider Medicine, reconnect with the knowledge that you are only as strong as you are connected. Connections, true, authentic connections with others involves listening and respecting personal boundaries.